Our organization is one of the leading company in the market for the manufacturing and supplying of Dewan Sets, which we made from fine quality Indian cotton . Available in various sizes, these Diwan Sets have already accredited a huge demand list in our accounts. We offer these Diwan Sets at most affordable prices to our precious customers. This exclusive design dewan set comprises one Dewan cover with set of five matching cushion covers and two matching Bolster(Masnad) covers. The Cushion covers possess the zip closing and the Bolster covers have string for closing. The embroidery applique patch work at the center enhances its beauty and elegance. The product represents a good example of traditional craftsmanship of Rajasthani artwork. This very elegant and attractive ethnic Jaipuri Poly Dupion Silk 8 Piece Dewan set contains one Dewan cover with set of five matching cushion covers and two matching Bolster(Masnad) covers. The Cushion covers possess the zip closing and the Bolster covers have string for closing. The embroidery applique patch work at the center enhances its beauty and elegance. The product represents a good example of traditional craftsmanship of Rajasthani artwork. Jaipuri Single Bed Sheet with one matching pillow cover of traditional Sanganeri floral print of Jaipur. This admiring bed sheet is embellished with intricate animal block print motif all over on white base. The product presents a good example of traditional craftsmanship of Rajasthan. Jaipuri Single Bed Sheet with one matching pillow cover of traditional Sanganeri floral print of Jaipur. This admiring bed sheet is embellished with intricate floral block print motif all over on white base. The product presents a good example of traditional craftsmanship of Rajasthan. 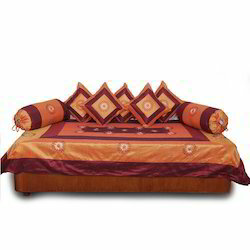 Jaipuri Silk 8 Piece Dewan set contains one Dewan cover i.e. 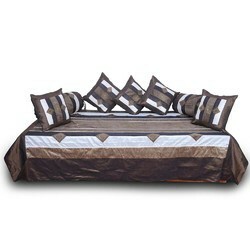 single bed cover with set of 5 matching Cushion Covers and 2 matching Bolster covers (Masnad). The golden yellow and cream floral silk embroidery at the center is very beautiful and pleasant. The product presents a good example of traditional craftsmanship of Rajasthan. 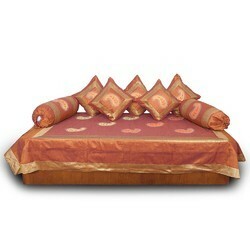 Jaipuri Silk 8 Piece Dewan set contains one Dewan cover i.e. 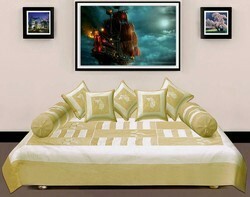 single bed cover with set of 5 matching Cushion Covers and 2 matching Bolster covers (Masnad). The greyish and cream floral silk embroidery at the center is very beautiful and pleasant. The product presents a good example of traditional craftsmanship of Rajasthan. 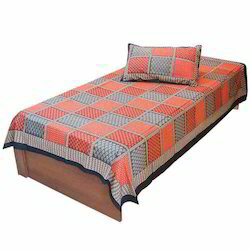 Jaipuri traditional Single Bed Sheet with one matching pillow cover in pure Cotton. This admiring bed sheet is embellished with intricate Bagru print all over on multi-colour base. The product presents a good example of traditional craftsmanship of Rajasthan. Jaipuri Single Bed Sheet with one matching pillow cover of traditional Sanganeri floral print of Jaipur. 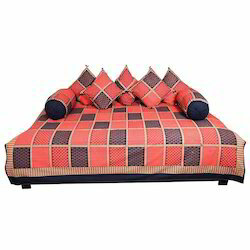 This admiring bed sheet is embellished with intricate block print motif all over on multi-colour chequered base. The product presents a good example of traditional craftsmanship of Rajasthan. Jaipuri Pure Cotton 8 Piece Dewan set contains one Dewan Bed Cover with set of 5 matching Cushion Covers and 2 matching Bolsters (Masnad) in traditional Sanganeri hand Block Gold Print of Jaipur. The product presents a good example of traditional craftsmanship of Rajasthan. These good looking bed covers in hand block print are a specialty of Jaipur. Jaipuri Pure Cotton 8 Piece Dewan set contains one Dewan Bed Cover with set of 5 matching Cushion Covers and 2 matching Bolsters (Masnad) in traditional Sanganeri floral hand Block Print of Jaipur. The product presents a good example of traditional craftsmanship of Rajasthan. These good looking bed covers in hand block print are a specialty of Jaipur. The very elegant and attractive ethnic Jaipuri Silk 8 Piece Dewan set contains Dewan cover i.e. 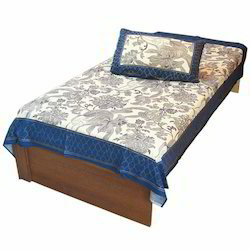 single bed cover with set of 5 matching Cushion Covers and 2 matching Bolster covers (Masnad). The traditional embroidery over the patch work makes it look very royal. The product presents a good example of traditional craftsmanship of Rajasthan. Jaipuri Silk 8 Piece Dewan set contains one Dewan cover i.e. 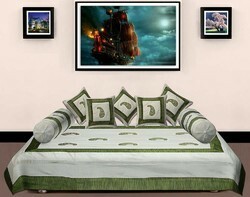 single bed cover with set of 5 matching Cushion Covers and 2 matching Bolster covers (Masnad). The Maroon and cream floral silk embroidery at the center is very beautiful and pleasant. The product presents a good example of traditional craftsmanship of Rajasthan. Jaipuri Silk 8 Piece Dewan set contains one Dewan cover i.e. 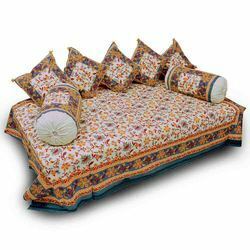 single bed cover with set of 5 matching Cushion Covers and 2 matching Bolster covers (Masnad). The green and cream floral silk embroidery at the center is very beautiful and pleasant. The product presents a good example of traditional craftsmanship of Rajasthan. Enhance the home decor of your interior with this Jaipuri Poly Dupion Silk 8 Piece Dewan set that contains one Dewan cover with set of five matching cushion covers and two matching Bolster(Masnad) covers. The Cushion covers possess the zip closing and the Bolster covers have string for closing. The embroidery applique patch work at the center enhances its beauty and elegance. The product represents a good example of traditional craftsmanship of Rajasthani artwork. This Jaipuri Poly Dupion Silk 8 Piece Dewan set contains one Dewan Bed cover with set of five matching cushion covers and two matching Bolster (Masnad) covers. The Cushion covers have zip closing and the bolster covers have string for closing. The embroidery applique patch work at the center enhances its beauty and elegance. The product represents a good example of traditional craftsmanship of Rajasthani artwork. Jaipuri Single Bed Sheet with one matching pillow cover of traditional Sanganeri floral print of Jaipur. This admiring bed sheet is embellished with intricate royal wedding block print motif all over on white base. The product presents a good example of traditional craftsmanship of Rajasthan. Jaipuri Single Bed Sheet with one matching pillow cover of traditional Sanganeri floral print of Jaipur. This admiring bed sheet is embellished with intricate floral booties print all over on white base. The product presents a good example of traditional craftsmanship of Rajasthan.